Tomorrow is the Fourth of July, one of my favorite holidays. Some of my favorite Independence Day memories include watching the glittering displays of fireworks against the night sky while lying in a giggling dog-pile with all the neighborhood kids, spending the day strategically eating as much as possible at our giant annual picnic, and of course, munching on crisp watermelon as the juice leaves sticky sweet trails down my arms. Actually, watermelon is probably one of my all-time favorite components of the 4th of July — and summer in general. Watermelon selection is an event in itself. Our run to the grocery store demands a good ten minutes of searching for the biggest and sweetest smelling melon. Then, it’s back home to slice it into wedges that disappear as fast as they’re cut. I love how versatile watermelon is, and hearing so much about watermelon flavored drinks lately makes me want to experiment myself. In particular, I hope to try this recipe for Louisa Shafia’s Watermelon, Mint, and Cider Vinegar Tonic because it sounds as crisp and delicious as the fruit itself. 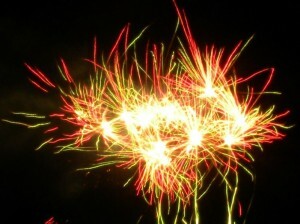 If you give it a go at your Fourth of July celebration, please let me know how it went! Another intriguing watermelon recipe, I found in the Parties That Cook recipe archives. One of my summer favorite recipes is gazpacho, a cold Spanish soup that is typically tomato based. This recipe for Watermelon Gazpacho with Shrimp Ceviche definitely sparked my interest! I’m so excited to try it myself, so I thought I’d share the recipe with you. We all have our favorite Independence Day memories and traditions. What are yours? Let us know in the comments! Roast Peppers and Corn: Roast red bell peppers over an open flame until blackened. Put into a paper bag for 5 minutes then peel off charred skin and remove seeds and stem. Roast corn over a flame, turning frequently, until the corn is charred. Chop and Puree: Roughly chop watermelon, tomatoes, cucumber, roasted red peppers and jalapeno. Cut corn off cob. Combine. Add chipotle and adobo, scallions, garlic, lime juice, cilantro, olive oil and salt. In a food processor or blender, puree the mixture until smooth. Transfer to a pitcher. Shrimp: Combine shrimp, lime juice, salt and cilantro and allow to sit for 3 hours. Drain off juice. 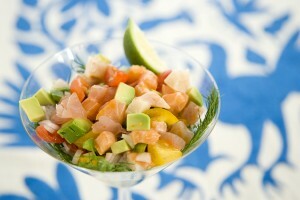 To Serve: In center of individual serving bowls place small mound of shrimp ceviche. At the table, pour watermelon gazpacho into the bowls around the shrimp.